I think everyone agrees that one of the hardest things to do in audio is to get really great sound in a normal-sized hotel room. Another very difficult thing to do is to get really great sound without bringing the speaker way out into the room. Then, there is the most difficult thing of all: getting a system to sound like music, not a great hi-fi system. Year after year at different hotels two guys consistently do this: Jeffrey Catalano of High Water Sound and David Cope of Audio Note UK. This was true again at this year’s Newport show. Both showed their products in regular hotel rooms, both played vinyl; both sounded incredible, and most of all both made me want to sit and listen for a long period of time. I wish I could have spent more time in these two rooms, but the show was just so large that it wasn’t possible. Still, I feel it is worth talking about these two rooms. When I sat down in Jeff’s room, he asked me what I would like to hear. Over the years I have discovered such great music in his room that I just said, “surprise me.” Now, a lot of the presenters at the show if asked that, would put on a sonic showpiece. Not Jeff. 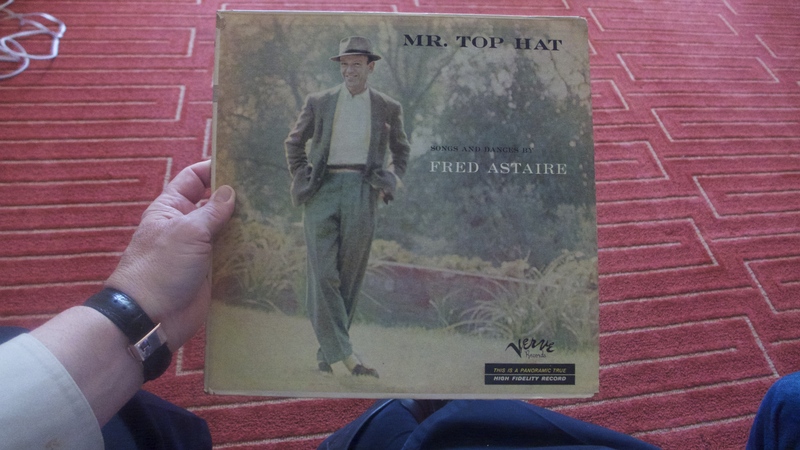 He put on Fred Astaire’s Mr. Top Hat, a mono LP that was less than mint. It sounded like Fred Astaire was in the room singing and dancing for us. Yes, I said dancing, you can hear him dancing on the recording. I had two listening sessions in this room and was simply amazed that anyone could get this kind of sound in a hotel room, especially from large speakers that weigh over 200 pounds. As I mentioned above, one of the things I love about this system is that these big speakers don’t have to sit way out in the room. The system consisted of a pair of Cessaro Wagner speakers driven by TW-Acoustic 300B mono blocks along with their linestage and phono preamp. The turntable was TW-Acoustic Black Night with two TW 10.5 tonearms. The two cartridges were both from Miyajima Labs; the stereo one was their Madake, and the mono cartridge was their Zero Mono. Everything was sitting on Silent Running bases and racks except for the speakers that were sitting on Symposium Acoustics Super Plus Speaker Platforms. All the cables were from Zen Salti. AC power was provided by Silver Circle Audio TCHAIK 6 Power Conditioner. The mono Fred Astaire selection says a lot about Jeff’s confidence in feeling there are people who will spend top dollars because they love music. I guess you noticed in the system above he didn’t have any digital source. Still, over and over again his rooms are praised by all in every show report I read. I know this system cost a small fortune, but it wasn’t the most expensive at the show by any stretch, and again I want to point out that Jeff got this great sound without exhibiting in even one of the medium size rooms. If you go to an audio show where High Water Sound is exhibiting, don’t miss it. 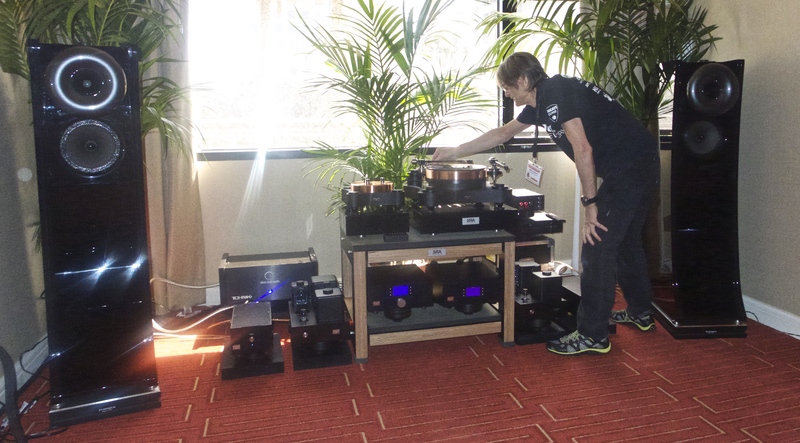 David Cope, who exhibits for Audio Note UK in America, most often chooses to put together systems for shows from Audio Note’s less expensive components. He does this and still gets amazing sound that is more like live music than systems that cost $200,000 and more. I’m not saying that this price range of Audio Note is better than those mega-systems, but that David gets better sound at shows and lets people know what kind of sound is possible for a reasonable price. At another show, I heard a young lady say to her husband, “now here is something I would love to have in our home.” At this show I kept hearing people saying, “I went into the Audio Note room and saw this little speaker and almost left, boy am I glad I didn’t, they sounded great!” I heard something along that line from about five different people. 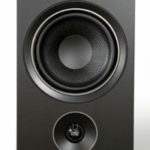 The system consisted of the AN K/SPe speakers I reviewed not long ago. If my review pair had been in this finish, I might have kept them for my second system. 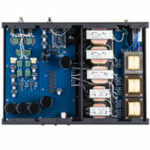 They were driven by the Cobra, Audio Note’s newest 25-watt, EL34 push-pull integrated amp. It has a built in DAC and wireless volume control. All of this from Audio Note for only $3,500. 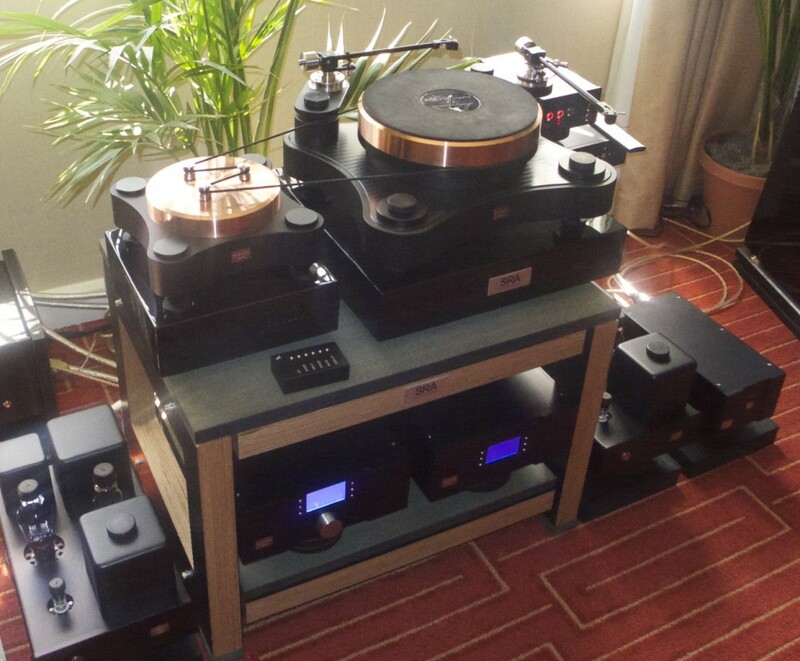 The source for this system was their brand new TT 3 turntable. It is a three-point suspended turntable with three Pabst motors. It has an outboard power supply and electronic speed controller. It was probably the one thing at the show I would most like to review. 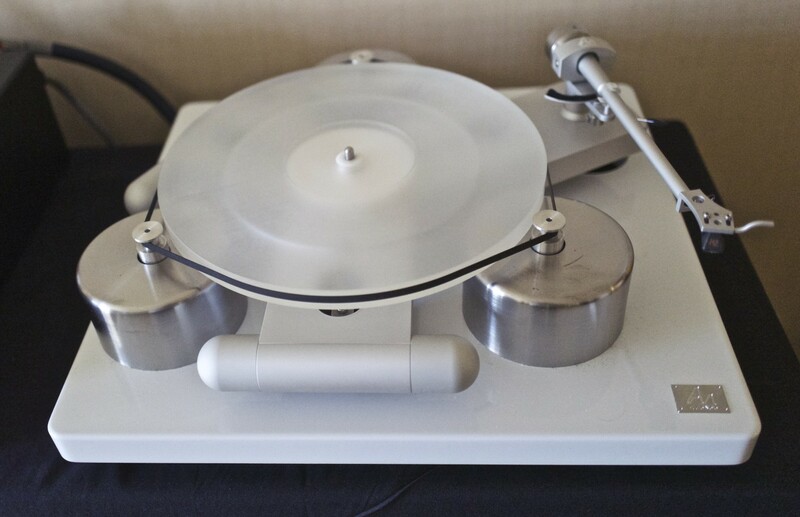 It sells for $8,000 and was paired with the AN 3 Tonearm that sells for $2,000. The system was finished off with the R-Zero phono stage and the IQ 3 cartridge. There seems to be more and more “lifestyle systems” at the show. I think with a system like this Audio Note is showing us, what a combination of an old-time “stereo” and a 21st-century “lifestyle system” can be. By the way, this wasn’t a great system for the money; it was simply a great way to immerse oneself in music. The Audio Note room is always good. I’ve heard them at about five shows now. 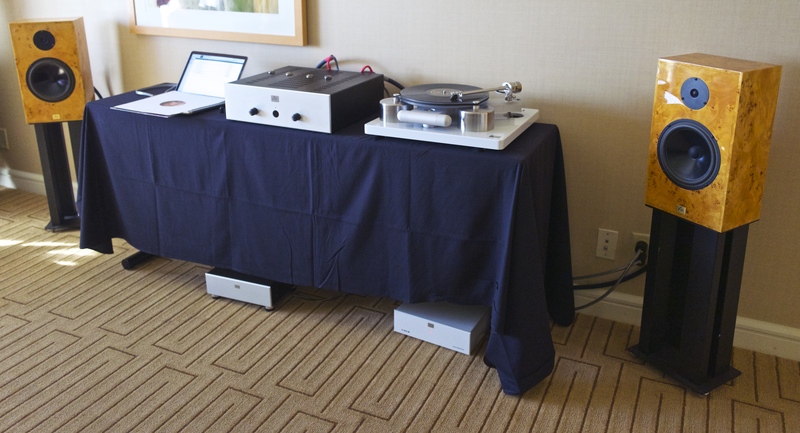 The Cessaro speakers at Newport sounded like many poorly designed and set up horn speakers. The upper range was bright and projected, while the lower range was dull. Maybe just the recordings being played, but I don’t think so. The Volti Audio horn speakers in another room just sounded beautiful by comparison. I beg to disagree I found the Volti very nice but bass heavy and still had some of the classic horn shout. As I said I love the Cessaros. This may help you to understand my taste in reproduced music. One thing I think we need to admit in high-end audio is that there is not “absolute sound” and that we need to find reviewers who tend to like the sound we like. Having said that, there is the likelihood that we heard different music on different days. I am lucky to know Jeff Catalano very well for 8 years and to own most of the TW Acustic Turntable playing at the Newport Show. 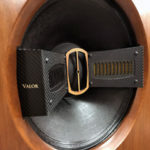 I heard the Cessaro Wagner Loudspeakers in a much larger room at RMAF last year. 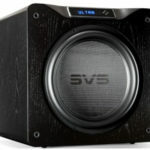 To say that those big speakers in a small room sounded as good as if not better than they did in a big room is amazing. In my opinion this year’s Newport room was Jeff’s best show achievement. Throw out the audiophile stuff and keep the music if you want a lifetime of enjoyment. That’s what a High Water Sound does.